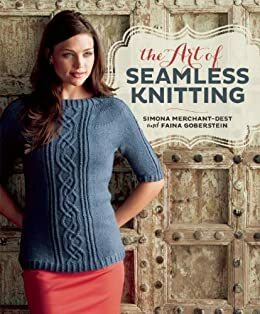 I would like to introduce a very talented crochet designer and author, Alla Koval, who I had a privilege to ask a few questions about her designs, her style, and her passions and inspirations. 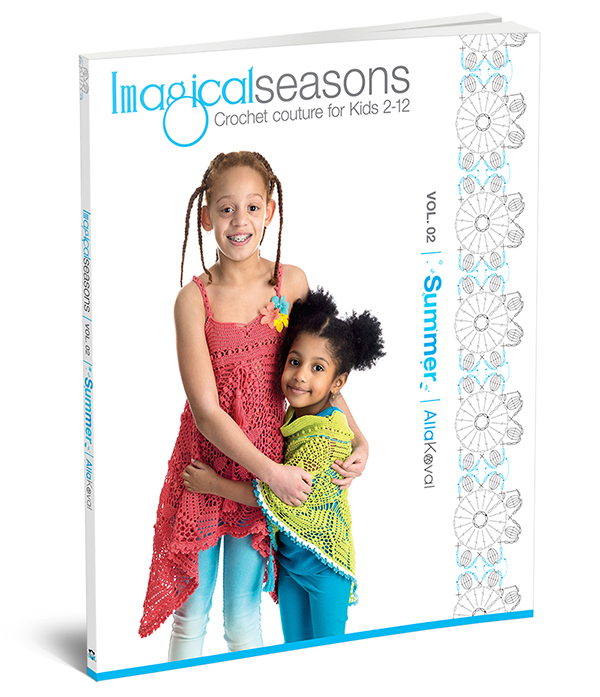 Alla has recently published two books, Imagical Seasons: Spring and Imagical Seasons: Summer; but her talents do not lie only with her crochet creations, but also with her beautiful photography. What caught my eye with Alla's designs was how bright, fresh, and fun her pieces were. They always were such a eye candy to me. Do not miss special promotion and a book giveaway at the end of the interview! 1. How did you come about to become a crochet designer? The beauty of crocheting I discovered after my daughter was born. I was completely hooked and amazed of all the magic and possibilities of crochet textures and techniques. But I must to admit that I do love both equally, knitting and crocheting, because they’re so different. I tend to use crochet more for lace on summer and spring garments and knitting when I want something more fluid or when I use textured yarn. And I just love to use both techniques together in one project - they both add so much to each other and give you more freedom. 2. How long have you been designing? I was designing as far as I remember myself. From early childhood I was involved into the joy of creating my own garments. My mom is a professional seamstress and amazing knitter and crocheter and she preferred to handmade most of dresses for me and my sister. As far as we all remember, I participated every single time - as a trouble maker when I was too small and as artist and designer once I got older. Му very first garment I designed and made by myself, was a sweater for my daddy which I knitted when I was about 11 years old. I was so proud from the fact that my dad loved it and wore that sweater until it practically started to break apart. Then during my teens and studentship I been knitting and crocheting , but rarely created any children’s items – just did not have much motivation. But when I got my own daughter, I started imagining all the cute things Kristin could wear and this is how I started designing children’s clothes... And then I realized that it was exactly what I wanted to do in my life. 3. How long have you been crocheting? Curiously enough, but I do not remember exactly when I learned to crochet and what was my first crochet project. I started knitting in the early years of school and back then, in Ukraine, I was mostly knitting with needles but I always had a bunch of crochet hooks just to fix something or to crochet embellishment, finishing edging and so on. Russian and Ukrainian languages don't even have special word for crocheting - there are "knitting with needles" and "knitting with hooks". Back in Ukraine I was mostly knitting with needles but always had a bunch of crochet hooks just to fix something or to crochet embellishment, finishing edging and so on. 4. What inspires you as a designer? Sometimes, the idea for a design just comes into my head and I don't know from where. I just visualize it clearly and then somehow make the mental images into something real. I call it “design as you go”, when having the rough idea is enough to get started. Other times, I find inspiration in paintings and photographs—Pinterest is an amazing source of inspiration and pure eye-candy. I look at things and try to understand if I can see something special what has to be noticed. Often I start by looking for unusual stitch patterns, and start building my ideas from them. It’s so interesting to see how a stitch pattern evolves when you start modifying it, especially when combining with other patterns! But most of my inspiration comes from colors of nature and changing of seasons. It’s no secret that I am endlessly inspired by beautiful colors, you just have to take a peek at my portfolio (http://allakovaldesigns.com/) to see that most my designs are thoroughly and obsessively color coordinated. One of a brightest memories from my childhood was my very first set of 48 color markers. I was super excited to experiment with the colors, and my mom paid attention to how I used them. Later she told me that when she asked why I combined the colors that way, I explained - “They felt happy together.” Well, I still have that excitement about colors, and l am always on the lookout for new color combinations to work with. 5. What inspired you to write books? I was writing separate patterns and even collection of related patterns for a long time and I like that process. But sometimes I had a wish to be able to work with longer format - this way I could add more details and ideas than in just a single pattern. And for a long time I thought that it is unreal challenge until I earned few skills - like stitch diagram drawing in Adobe Illustrator and working with long-long documents in Adobe InDesign and some more - and I became really fast and productive with these products. Even then I was in doubts if I can write a book. But one day I stepped aside and observed what I was working on and realized that it was all aligned with the book I dreamed about. I gave up and started my first book adventure. 6. How did you come up with the theme for your new books? I started my first book project with pretty simple idea: everything about imagination and inspiration, and for every season. But time went fast, content grew up and I started to feel myself somewhat uncomfortable. I was unable to understand the reason until the day when I printed unfinished book and it was clear that book is too big already. That day I decided to split content into four books and it magically changed everything - I've got more space to express my ideas, the title got new meanings, plus I instantly became author of very first four books! :o) Well, this "instant" is still going on but for me the puzzle was solved. 7. Your name sounds Slavic. Are you from a different country? My home city is Poltava, Ukraine; it has long history and many traditions and I love my city; my family is still there and I love to come back to them from time to time. I finished high school over there and moved to bigger city, called Kharkov, Ukraine to study in University. Even if both cities are only 3 hours on the bus apart, I started to live alone and that's a big difference, as you can guess, and I had many friends, memories, stories and adventures and also love that place. After graduation I was working as a software developer for almost a decade. In 1999 I moved from Ukraine to Seattle and that's where I live with my family in our not big but lovely house for last 16 years. 8. I’ve noticed that with each pattern is accompanied by a comprehensive chart, which I absolutely can appreciate and love seeing. Do you make your own or do you have someone to help you with creating those charts? Oh, I really can't describe how I am happy to have realized one of my biggest dream in pattern's creating - learn how to draw stitch diagrams in Adobe Illustrator! I just adore this software and so glad with a new and exact look of my diagrams I wanted!! As a visual person, I always was a big fan of stitch diagrams, and now I am not only so enjoy draw them, but I amazed how much they help in writing instructions to avoid many mistakes and make instructions more clear. Not to mention that providing stitch diagrams make work tech editor much easiest! 9. You design for children and teens, have you been inclined to design for other demographics? Yes, so far most of my designs are for children, actually for girls, 2-12 years old. I definitely would love to design more for boys and one of my future project would be to create a boy's line. It's just a "timing" thing. I also enjoy to create accessories for ladies—scarves, hats, wraps, necklaces, pins, etc., which appeared in several magazines, including Interweave Crochet, Crochet! and couple more designs will be featured in coming Crochet Scene and Crochet World publications. My patterns for knit and crochet garments and accessories also can be found at mylittlecitygirl.com and in Imagical Seasons book series. 10. What draws you to design for girls and teens? My daughter Kristin and all these little wonders with their such precious personalities! 11. I love your style; where does your style comes from? Thank you Simona, I very appreciate the compliment! I think that most of the successful styles in all human areas come from understanding simplicity - even if final result looks complex or has tons of details, it should be simple in realization. I see this idea in nature, architecture, in graphic design, and even in music; and this is what I try to follow. I had many successful gorges designs done in pretty complex techniques but I both happier and more productive if complexity level is low so that's how I see my "style": stay simple and colorful but look amazing! 12. What have you learn during your designing years? How did your style or techniques changed? 13. What are you future plans design-wise if you can share? It's very tough question. I have tons of plans and ideas! I am working on next 2 books - Fall and Winter, both should be finished and printed around New Year! And then few more! Plus I have few new patterns in different stage which I plan to release in nearest months. 14. And something personal, do you have other hobbies or obsessions such as crochet? 15. How do you relax? 16. What is your favorite thing to do? Live, feel myself alive and enjoy from life. 17. Is there anything you wished I asked you and I didn't? I would add couple words about my Imagical Seasons book series. I wrote these books pretty much to express myself to the other crocheters and designers. What I was trying to say and who could listen that? The main message, I believe, is a language of design and inspiration which is not only international but target all ranges of skills. I tried to show how to apply same pattern in different ways to get outstanding results. I created a totally new style of my patterns, and now each pattern includes: unique and very detailed crochet stitch diagrams, schematics, tutorials, easy-to-follow written instructions and stunning full-color photos. Many Thanks again to Edie Eckman for tech editing my patterns and her Edie Eckman’s How to Say It class! They never were in such terrific shape as now, yay! I see my book to be useful for English readers from US or Europe and for readers with no English at all; useful for crocheters of any skill level - from beginners and to advanced designers; and finished projects to be worn by girls from 2 to 12 years old and some pattern are suitable for adults also! SMD: Thank you so much Alla for the interview! Alla is offering a special to her blog tour readers who purchase the print edition of her book to get the digital edition for free! 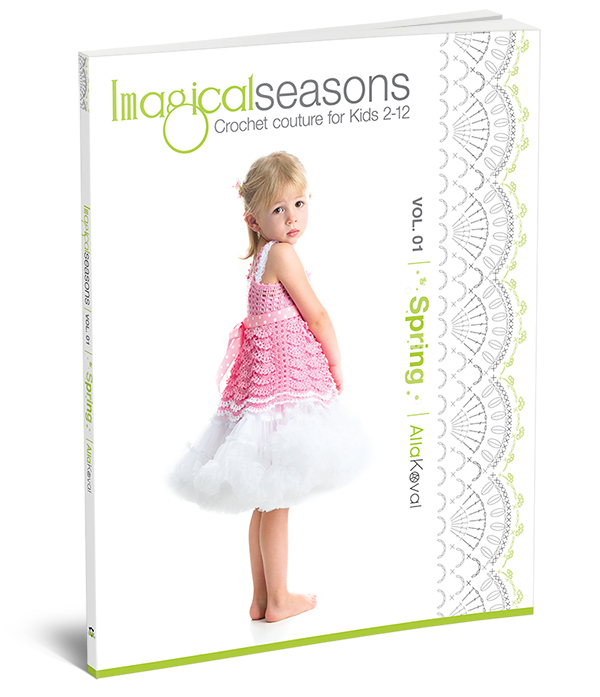 You can obtain your free digital copy after purchasing the print edition on her Imagical Seasons website, and Etsy and Amazon will run this special through August 1st. To receive it, use a promo code "IMAGICAL". And of course it wouldn't be a proper book blog tour without a giveaway! One of you lucky readers will receive a copy of both of Alla's Imagical Seasons: Spring and Summer books. If the lucky winner resides in the U.S. or Canadian, a printed editions will be received; if an international winner, a digital copy will be sent. You have until 11:59 pm EST on July 25, 2015 to leave a note in the comment section, and the winner will be announced in the comment section as well as other media outlets. Good luck! Follow Alla's book blog tour on the following websites. Very interesting patterns! The one I really like is the Silverlace Blanket! Classic with a twist! Hey guys, thank you for commenting! Our winner is Katelyn. I will be contacting you on Raverly. Check the rest of the tour and enter again for another chance to win. I am so excited! Thank you! I just sent a message to you on Ravelry. Thank you, Thank you! I read above information and very appreciate with it. I aspect all blog reader will be read and getting very helpful support. Very useful information thank you For sharing this. Nice and Useful information you have shared on your blog..Thank you for this wonderful sharing..Keep sharing..
We are a leading Social Media Marketing Company India. We create attractive and innovative marketing strategies and provide solutions for all your Social Media Marketing Services needs. Amazing information, Thanks for share this informative blog with us. Visit following page for web design services. Visit for Website Designing & Development Company at Ogen Infosystem. Thank You! For sharing such a great article, It’s been a amazing article. It’s provide lot’s of information, I really enjoyed to read this. Nice and interesting post,I appreciate your hard work,keep uploading more, Thank you for sharing valuable information. This is a Flickr badge showing photos in a set called Patterns you can buy. Make your own badge here.